Mysterious Yarns: Rebus is Back! 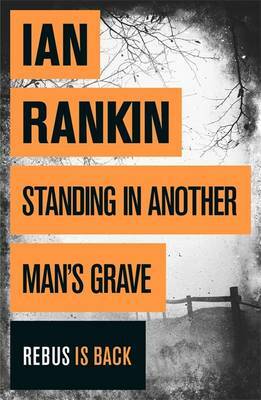 Standing in Another Man's Grave by Ian Rankin. I can't have been alone in doing a little happy dance when I heard that Ian Rankin had turned to his most famous detective creation for his latest book. Not that I didn't enjoy The Complaints or The Impossible Dead; Not that I didn't like Malcolm Fox, because I did. But I love John Rebus. And reading this book was like putting on a pair of comfortable old shoes - no irritating little blisters, no stiffness to be worn in (can you tell I spend a lot of my day on my feet!) - this was sheer pleasure all the way. Since we last met Rebus on the day he retired, he's come back into the force in a civilian capacity, assisting the cold case squad. He hasn't changed - still drinks too much, still very much alone, still a maverick with a healthy disregard for authority. So the plot is about a young girl who goes missing on her way to Inverness from Edinburgh. Trouble is she's the step-daughter of a local crime lord and he's not a happy man. Then a woman contacts the cold case squad to alert them a series of similar disappearances including the woman's daughter ten years before. It seems several girls have disappeared along the same A9 road through Scotland and in each case a photograph has been sent to someone from their mobile phones. With a little assistance from Siobhan, Rebus manages to get himself attached to the investigation. But is there room for an old-style copper like Rebus in today's slick police operation, headed by a new generation of bright young things? Meanwhile, it seems that Lothian Police have raised the retirement age for their police officers, meaning Rebus is free to reapply to join the force. Malcolm Fox is convinced that Rebus is a wrong un, and that he should never be allowed to return. Rebus' relationship with his old nemesis Big Ger Cafferty is just one of things that Fox finds distasteful. So can our favourite detective convince Fox that he's on the level. Can he return to the job he loved, and does he really want to? Basically the question is - where does an old dinosaur like Rebus fit with the new shiny face of modern policing where solving crime is done by computer. Is there room for a dangerous maverick like Rebus and his old school style of detection which involves talking to a lot of people, shaking a lot of trees and seeing what falls out? I'm not going to spoil the plot by giving you the answer to that. But if you're a Rebus fan then you'll love this book. If you're a crime fan you'll love this book. Just go read it. I was reading a proof of Standing in Another Man's Grace by Ian Rankin, for which I must thank the good people at Orion. The book is published on Thurday 8th November.